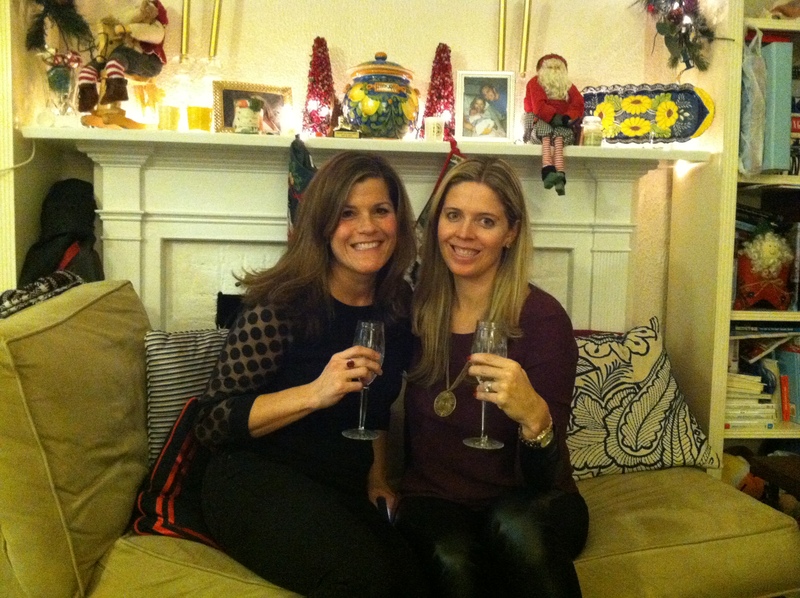 The Christmas Cookies & Champs Party was a perfect success! It was an evening of festive treats, sassy sips and indulgent girl talk – and everyone got to go home with an adorable box of 24 different Christmas cookies! 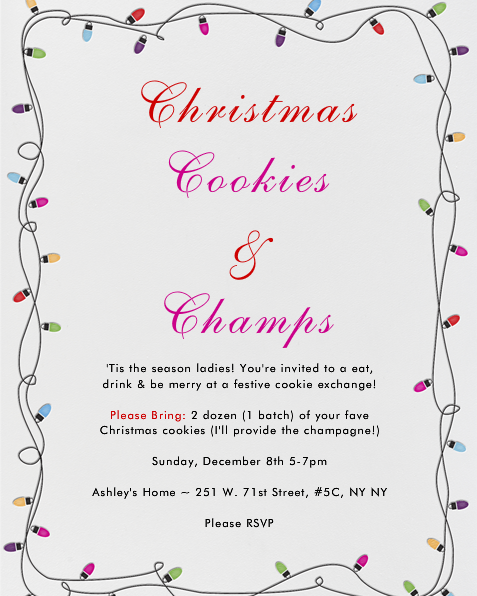 I would recommend this party to anyone who wants to sneak in some girl time amongst the choatic month of December. 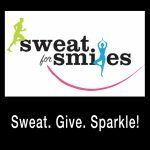 Here are all the details in case you want to start planning your party NOW. Plan It: We sent out an enticing & festive invite a few weeks ahead of time to get on the party guests’ calendars! 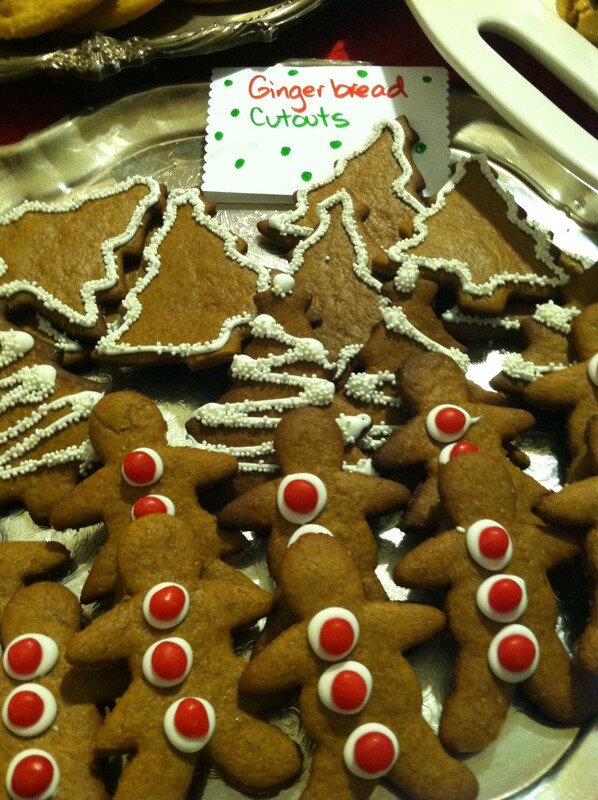 Each guests baked 2 dozen cookies for the party. 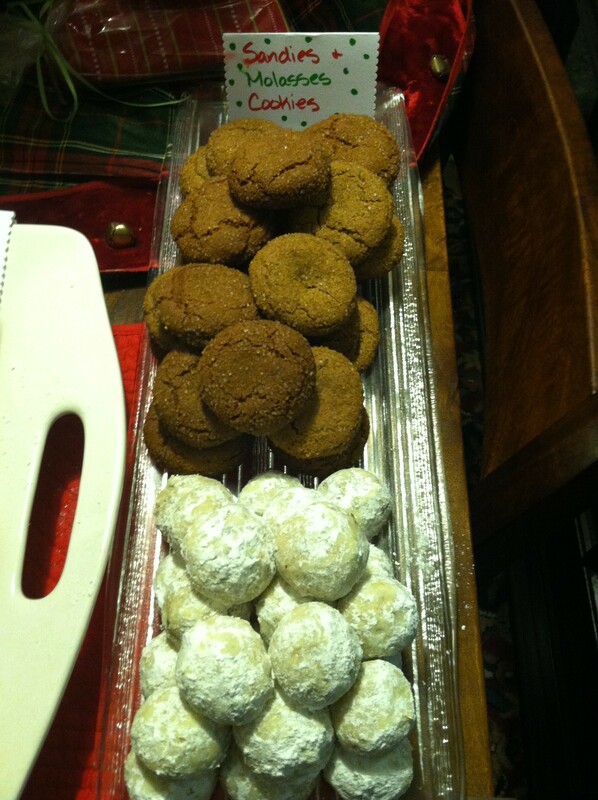 As they arrived, we set the cookies out on beautiful trays on the Christmas decorated table. 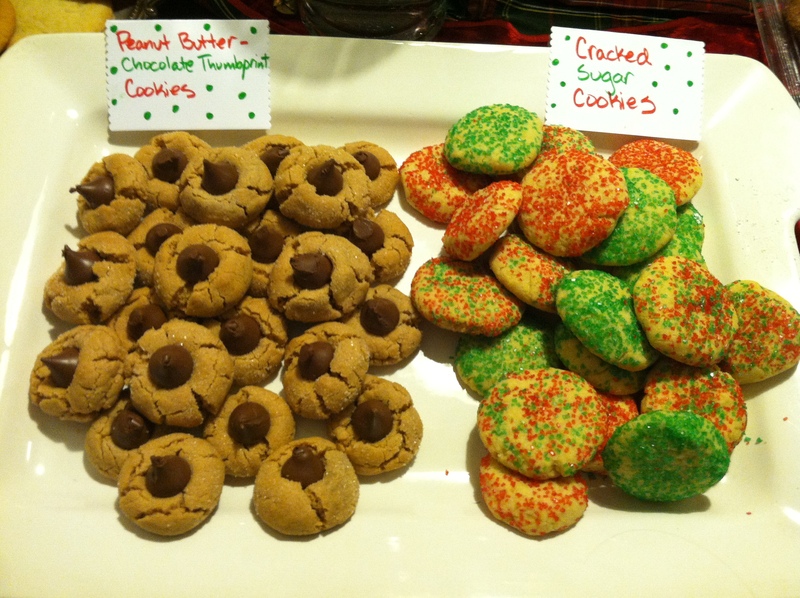 Enter Now: Want to really impress your guests/fellow cookie exchange friends? 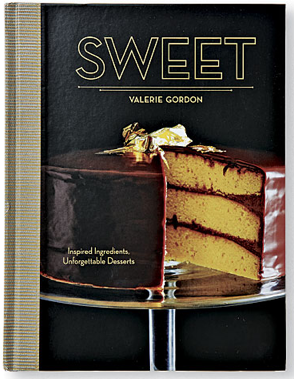 Try a recipe from Valerie Gordon’s SWEET: Inspired Ingredients, Unforgettable Desserts. You can enter to win this book through this month’s amazing “A SWEET Cuisinista Giveaway“. Not only is this a BEAUTIFUL book (the quality of the cover and inside photography is breathtaking), there are really great recipes in there for every sweet thing from cakes, pies, and tarts to chocolates, cookies and jams. 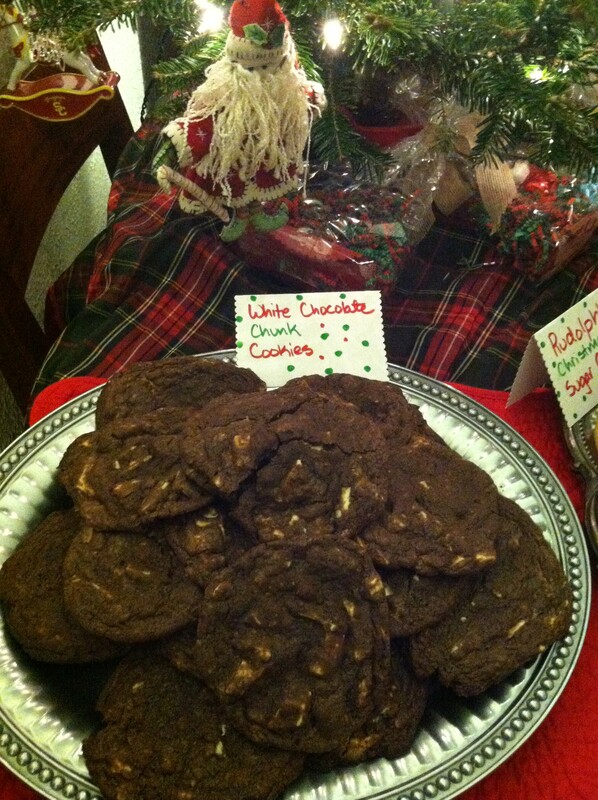 My personal faves from the cookie section include gingersnaps, white chocolate macadamia, salted- peanut blondies (wow – I have to make these), classic shortbread and much more! 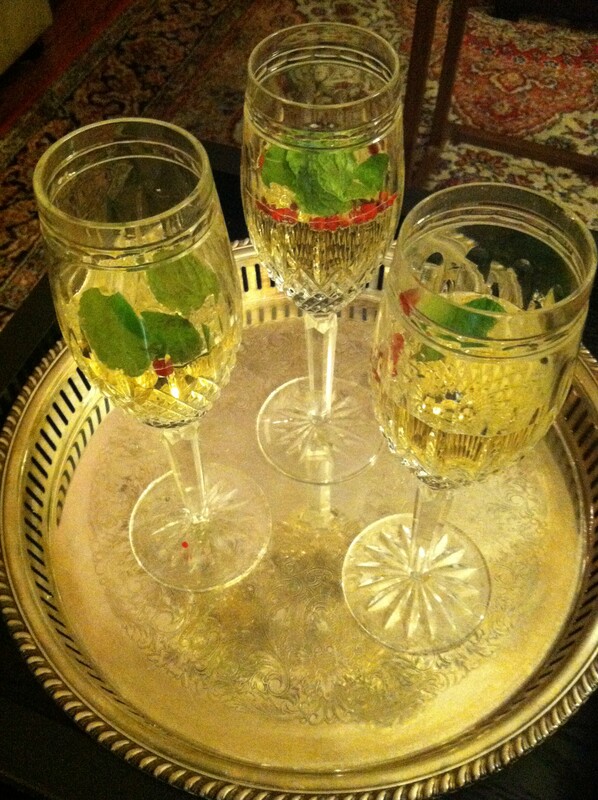 We all enjoyed festive champagne cocktails with a splash of St Germaine, pink peppercorns and mint leaves. 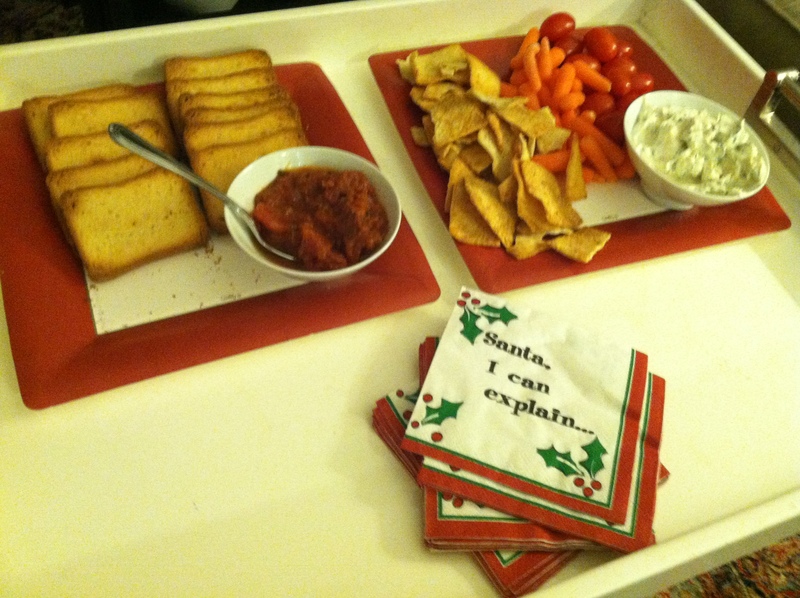 I set out some light salty snacks for nibbling – Veggie Dip & Bruschetta – to balance the sweetness of the cookies & champagne. I set up a cookie wrapping station (cookie boxes & foil) by the cookies for guests to wrap up their new assortment of cookies to bring home. Since we had 8 girls, each of us received 3 of each type of cookie. 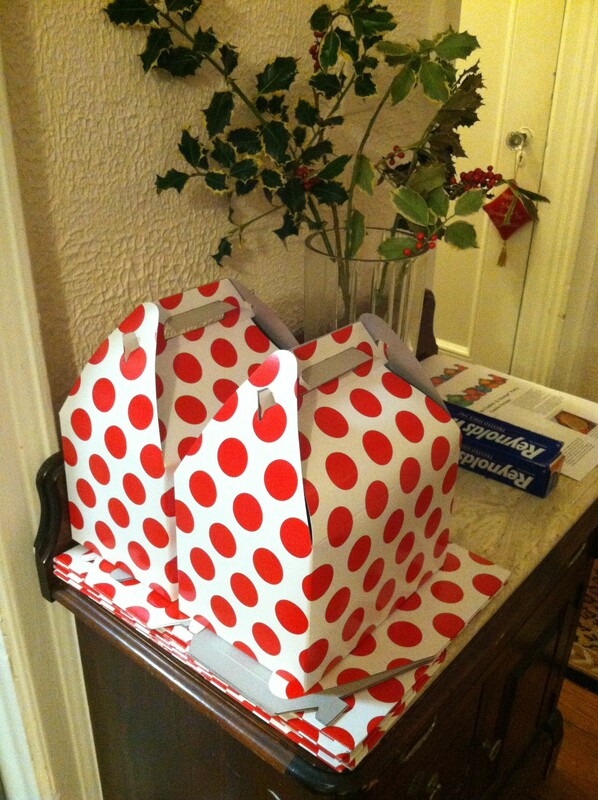 I was able to find these adorable red & white polka dot boxes on Etsy which served as perfect-sized cookie boxes! Also, everyone sent me their recipes ahead of time so I was able to pull together a Christmas Cookies Recipe Sheet for everyone to take home. 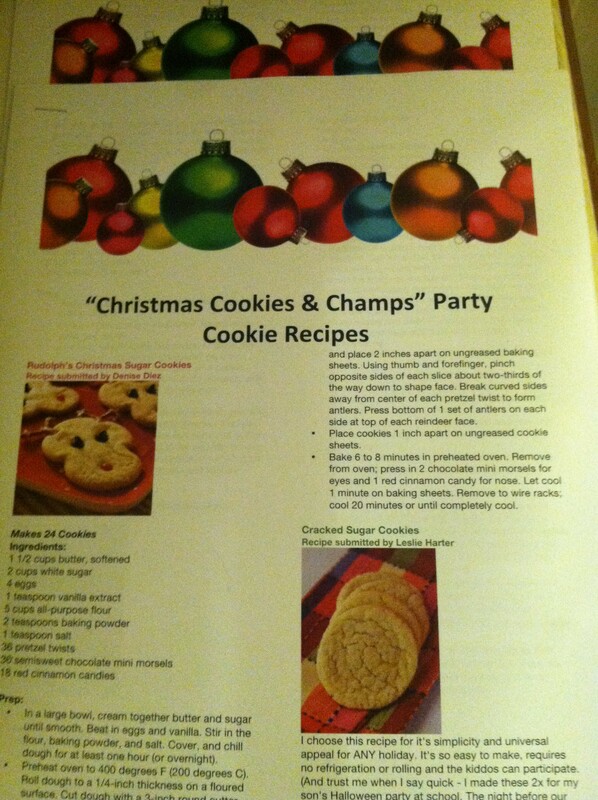 Click Christmas Cookies Recipe Sheet to download it for yourself! 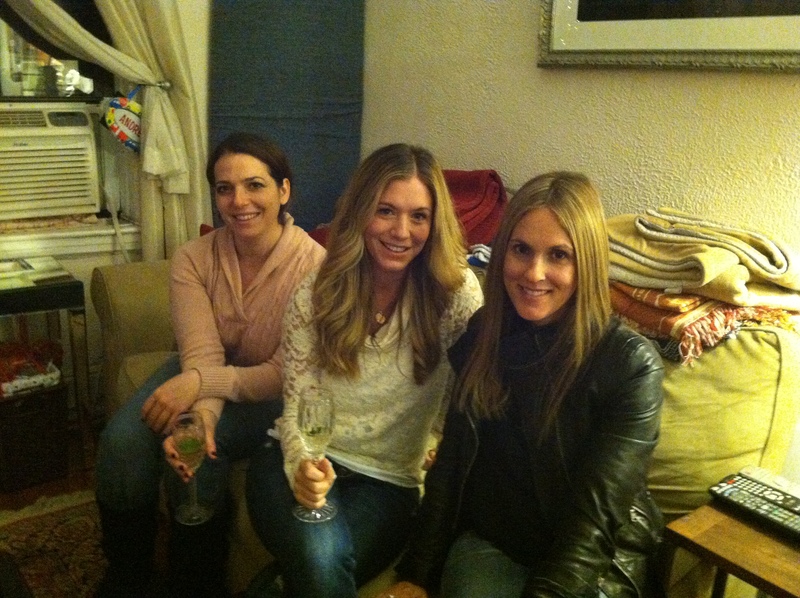 Girls arrived in casual chic attire ranging from leather pants to jeans with festive tops. That’s it! It was the perfect evening if you ask me. I’m sure you’re will be too! 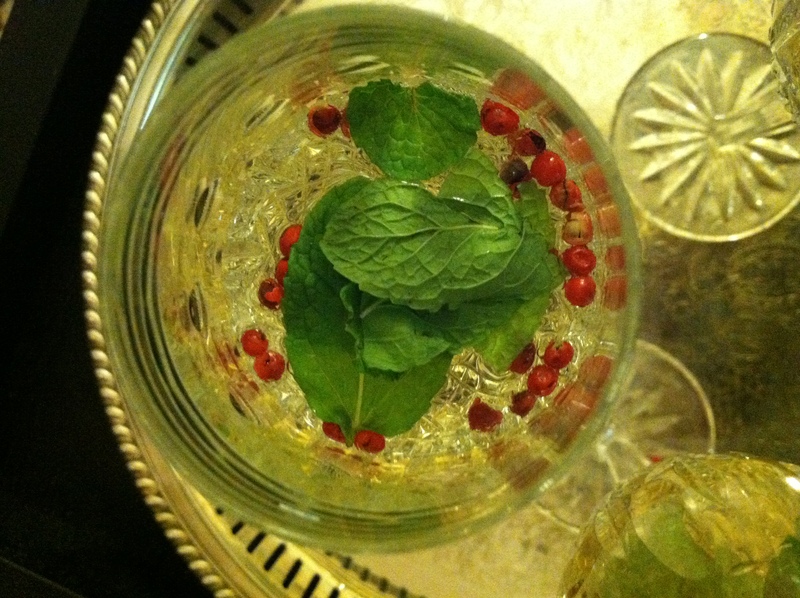 This entry was posted in Blog, Party Themes. Bookmark the permalink.